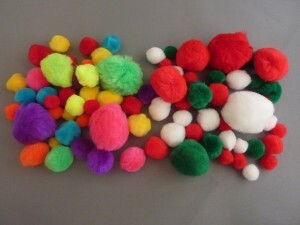 This is one of my most favorite My Obstacle Course purchases and I actually bought this package of multi-sized, multi-colored cotton puff balls at Michael’s for my first Obstacle Course with Andrew. They were great then and I am still finding ways to use them! I’d say I’m getting an excellent return on this investment :). Using something like this requires a little bit of thought (I mean teeny, tiny because I’m giving you some suggestions) but almost no time spent putting a fun station together other than picking out the colors/sizes you want to use. I love things like this which make it super simple!! When using them in a station activity, I first decide what skill I want to work on with him and then choose the puffs from there. I also think about the theme we are doing so, for example, around Valentine’s Day, I would pick out the red ones and do an activity with just those. I store them in a plastic bag the closes so I don’t have puffs all over the place. Click here for a link to a “puff” search on past posts. For this station activity, Andrew was working on oral motor skills, specifically getting his lips to create an “o” to blow air out of. We began this station with a straw to blow through and that helped so much. It gave his mouth something to form around. We gradually progressed to doing it without the straw. He was getting so much better at this (he used to blow air out of his nose thinking that he was doing it if it was making the same sound 🙂 ) so I thought I would throw in some larger puffs that would require more power from his breath. I also used a timer to see if he could blow all of the puffs to the window within a certain amount of time. A little motivational challenge for him! Andrew blowing the puffs across the bench towards the window. The puff blowing helps build oral motor skills but also provides a way to sneak in some other skills, like building receptive and expressive language. I would do this by asking him which puff he wanted to blow (ex. large or small, green or red) or tell him which one to blow and see if he understood which puff that was. 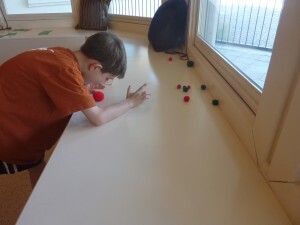 This gave me a lot of great information about where he was with this stuff and he has a blast blowing them into containers, off of the counter or like above, blowing them towards the window before the timer runs out. 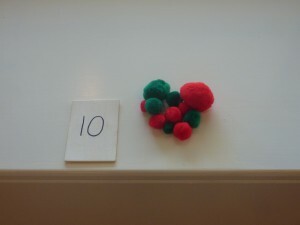 Remember, this is just one example activity that uses these colorful puff balls. Check out past puff posts link above to get more ideas! !